How to get started with blogging - who am I? Yesterday, I was asked to do a presentation on Social Business to an internal audience. 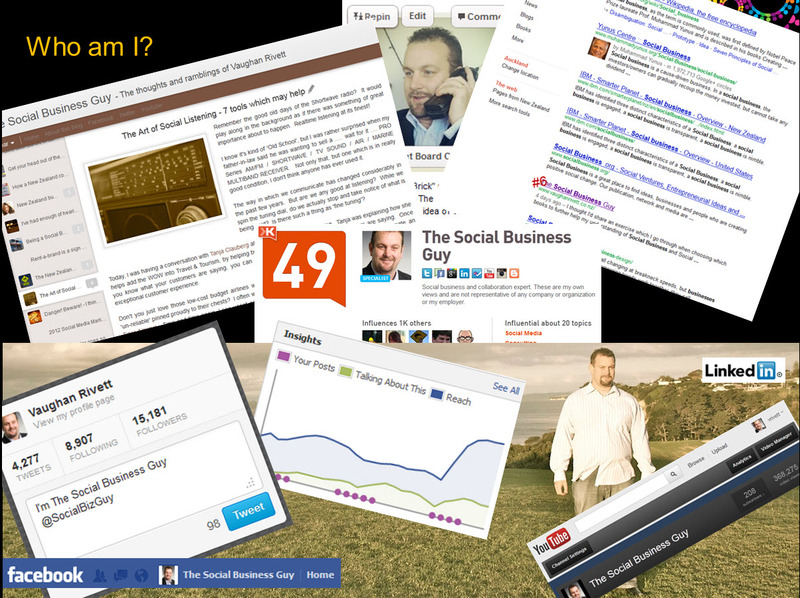 As part of this I thought that I’d put together a slide showing my online Social Media profile. I’m not wanting to blow my own trumpet, but I did surprise myself to some extent. I’m don’t want to fool anyone into thinking that building an online social presence is an easy thing. Last night I attending a networking event, hosted by the BNZ on the corner of Queen Street and K’rd. As I got talking to a number of local business owners, a couple of them got interested in what they could be doing to help their business online. It all seemed to be a massive undertaking for them and they didn’t know where to start. My advice, start small. While I’ve been able to pull together a comprehensive social presence, you need to be aware that this didn’t happen overnight. It has taken years of hard work and trial and error. I suggested that both of these gentlemen start with something which is easy, has high impact and is easy for them to get their head around. Blogging. Blogging is an easy way to get started. You get to write about the things you do which may help your target audience. You can get carried away with analysing visitor statistics and driving traffic to you blog, you don’t have to. Just keep it simple. Write meaningful posts which contain helpful information. It’s all about building social trust and credibility. So where do I suggest you go to start? There are services which you can use to get a free blog site. Search Google for either Wordpress or Blogspot. I’ve used both of them. Don’t get caught up in conversations with other bloggers about which one is the best, it doesn’t really matter at this point. Right now you just need to keep it simple and get started. Once you get started, don’t expect great things overnight. It will take time. However, you need to be consistent. Work out how many times a week you’re going to blog. I suggest that you start small. Choose to blog once a week or even once a fortnight. Over time as you either feel enthusiastic or start seeing real value, then increase the number of new posts.